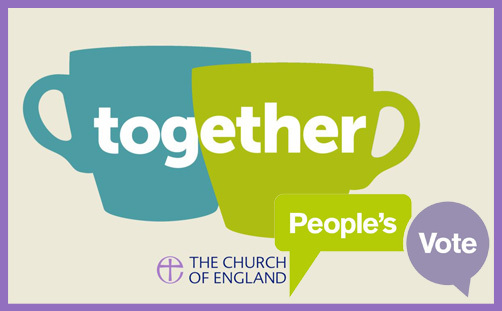 At this moment of national crisis and international humiliation (which it is), the Church of England is encouraging people to come to church to be ‘Together’ for a cup of tea and prayer (not necessarily in that order). This is refreshing and edifying: political chaos need not generate spiritual confusion; the temporal powers should not prevail against the essential ecclesial mission. Prayer meetings are marvellous things (especially with tea), and we are exhorted to pray fervently (Js 5:16) without ceasing (1Thess 5:17), for the prayers of the righteous, in solidarity with Christ, bring healing and reconciliation, if not resolution and salvation. ‘Ask, and it shall be given you‘ (Mt 7:7) is an intercessory act of faith, and at this time of chaos and confusion the nation needs men and women of God to be channels of grace and peace, to show the world a more excellent way. 1. What effect has Brexit had in your family relationships, friendships etc? If you disagreed, has it been possible to disagree well? 2. Putting Brexit to one side what are the three main things we have in common that we can build on for a better future as a community? What are the three main things as a nation? 3. What would it mean to live as a people who believe in the Cross and the Resurrection? What might be the “cross” experience for our community – and what would resurrection look like? 4. How can we work together to build a more just society which is at peace with itself and committed to a better future for the next generations? It’s is good to talk, but suggestions 3 and 4 are absolutely not conversation starters: in fact, to ask “what would resurrection look like?” in the context of Brexit is more likely to bewilder and divert from the essential task of prayer than it is to edify or support those seeking peace. When praying about the UK’s future relationship with the EU it is best not to get waylaid by new models of mission or disputes about Niebuhr’s paradigms of Christ and culture. 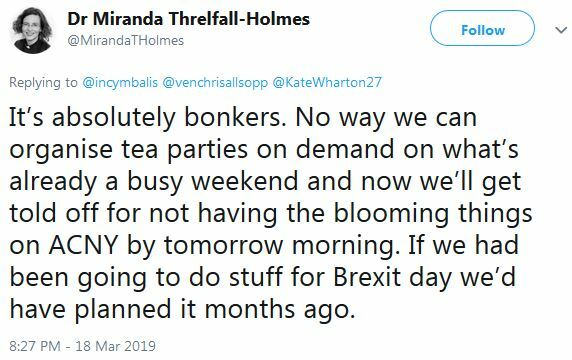 Useful conversation starters include questions like: ‘Hi, would you like a cup of tea?’ followed swiftly by: ‘Did you see that AC Grayling tweeted there were two million people of the “People’s Vote” march?’ Or ‘What lovely weather we’re having, aren’t we? Who is your favourite to succeed Theresa May?’ And thereafter the conversation will flow quite naturally and passionately (provided the leader steers proceedings in an unbiased way and restrains uninstructed or un-Christian utterances, including pompous and patronising comments against the 66% of Anglicans in the pews who voted for Brexit). As followers of Jesus Christ we are called to demonstrate that love for God and for each other, along with compassion, solidarity and care for the poorest, are our defining values. These values have been the bedrock of our national life for many centuries. They are not simply our history: they are also our best hope for the future. For this reason, a century from now the Church will be remembered for how it responded at this crucial moment in the life of our nation and country. Will we be those who worked to defuse tension and hostility? Will we be those who called for civility and respect in how we speak about, and treat, each other? 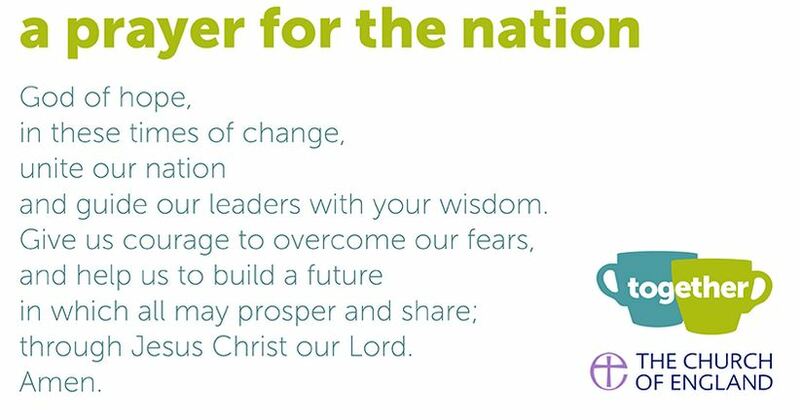 Will we be those who never stopped praying with urgency and hope for our country, our communities and our political leaders – and for a way forward that allows every person, family and community to flourish? This is an opportunity for the Church of England to join together in prayer for God’s kingdom to come, and for the good of all in society. I hope that each of us will take hold of these resources to help us pray for our country at this critical time. 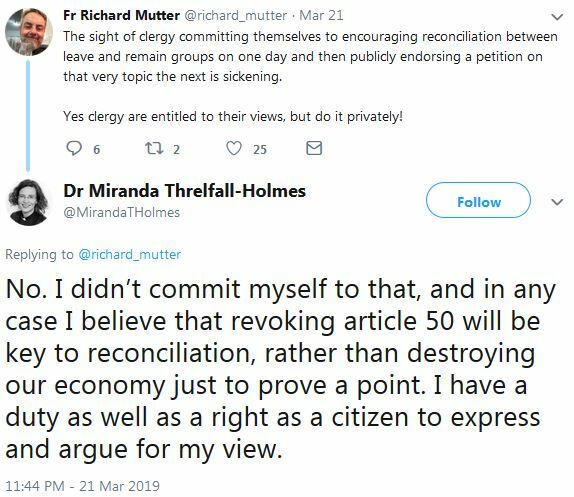 For Dr Threlfall-Holmes, resolution is not to be found in tea and prayer (or even just prayer): peace and reconciliation can come only by revoking Article 50. This happens also to be the strategic preference of many Remainers in Parliament: if it looks as though we’re heading for the “moral failure” of ‘No deal’ (ie a clean, global Brexit on WTO terms), we must revoke Article 50 as a matter of urgency the day before. There is, frankly, no more sure or certain way of precipitating civil unrest. That a vicar is advocating such a breach of faith in the democratic process instead of working toward acceptance of the majority will is astonishing. He probably can’t wait for the bigoted Brexiteers to leave his church, to put him out of our misery. My problem with it is that it’s so inward-looking. It mentions our families, our communities, our nation and our leaders. But I don’t see any reference to the European family of peoples and their flourishing, any sense that Brexit is at risk of damaging long-cherished friendships and alliances across our continent. I don’t see any acknowledgment of what we as the people of Britain have been able to contribute to the EU, nor the ways in which we have been able to act together to champion the poor and the voiceless, human and social inclusion, leading in environmental concern and helping to foster peace, justice and reconciliation in Europe. Christianity urges us to think in a Catholic, that is, universal, way about community. As part of a worldwide company of Christian peoples, surely the C of E should be modelling the ability to think beyond its own national and ecclesial boundaries. 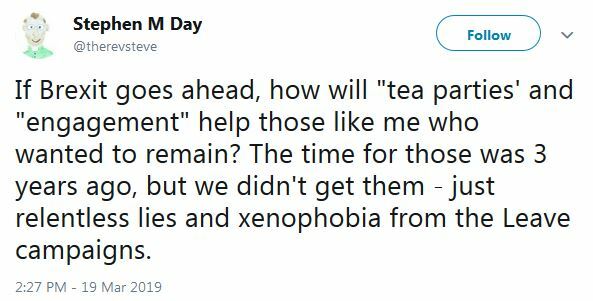 Why was this opportunity missed when it comes to the issues we might explore at tea-time? How can a church which is riddled with divisions on so many fundamental issues of ecclesiology, soteriology and morality possibly pray with integrity for the unity of the nation? How can a church which is fractured between its 66% of regular-worshipper Brexiteers and 99.89% of Remainer clergy (and 100% of bishops) pray with efficacious conviction for the unity of the secular-temporal? How can the Church of England pray against the mote of societal-political division when its own beam of spiritual disunity belies its profession and witness of a redemptive community? Doesn’t judgment begin at the house of God? And why should the nation be unified at all? Isn’t division and robust debate a sign of a healthy functioning liberal democracy? Ought not the prayerful ‘Together’ objective to be reconciled diversity rather than unity? Shouldn’t we be fostering and manifesting friendly division rather than scorn and spreading ‘project fear’ disinformation? Shouldn’t clergy be tweeting about peaceful coexistence in accordance with the general doctrine and mission of the church rather than forcing their personal political prejudices down the throats of their parishioners? Unity is to be valued in society (and visibly pursued by the Church [Jn 17:21]) in the sense of a truly common life, but political diversity and philosophical difference are to be encouraged as iron sharpens iron (Prov 27:17). 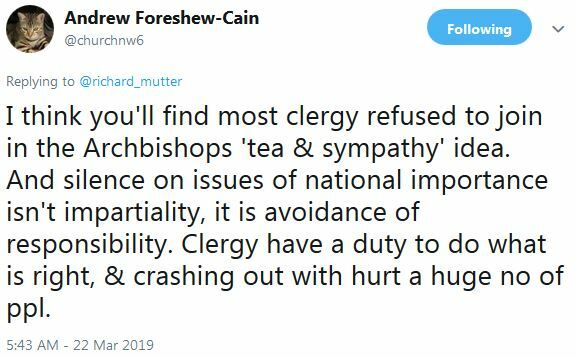 It might help if Remainer clergy focused on the unity which should characterise the Church, which is concerned with loving the neighbour as themselves by losing all sense of distinction between Leave and Remain; between Brexiteer and Remoaner. Perhaps if, instead of issuing fractious, divisive tweets suppressing or dismissing the popular democratic will they expanded their self-consciousness to include those with whom they disagree in radical empathy, they might become attuned to the ‘other’ and graciously responsive to political difference. And then they might even begin to model the distinctive form of unity for which they refuse to pray or put the kettle on.